Exposure in The Lifestyle Guide gives you access to over 52,000 high end consumers. Our target market includes Sydney’s coveted inner city and immediate eastern surrounds, and also national & international property investors with budget between $1M - $10M. It is the perfect target market for any product, service or business looking to reach a lucrative audience that is both affluent and demographically diverse. 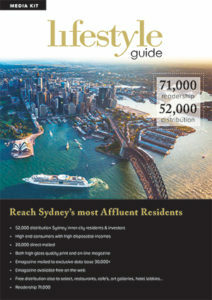 In terms of the precinct, The Lifestyle Guide is individually delivered to thousands of residents and investors that includes core suburbs: Sydney CBD, Walsh Bay, The Rocks, Surry Hills, Darlinghurst, Surry Hills, Potts Point, Elizabeth Bay, Woolloomooloo and Darling Point. Some of the exclusive residential developments we target include: Bennelong Apartments, Cove Apartments, Walsh Bay, The Hyde, Barangaroo, Rockwall Apartments, The Horizon, Woolloomooloo Wharf, Observatory Tower and many more. It is also delivered to many investors who own investment properties in these developments who live both locally and worldwide.